Every leader needs to communicate—whether in small groups to his or her staff or to thousands of employees, shareholders or the public. Every communication has a different purpose and creating the appropriate message can be daunting. Executives must distinguish between informational presentations vs. behavioral presentations. Informational is transmitting information only; there is no need for audience members to take any action. On the other hand, behavioral is about asking the audience to do something – to take action. Internally a company executive may be trying to inspire his or her employees. Although it is not easy, it is important to get outside of your head and to speak from your heart. After all, people are moved to action by emotion. We make decisions via our emotions and support them via logic. 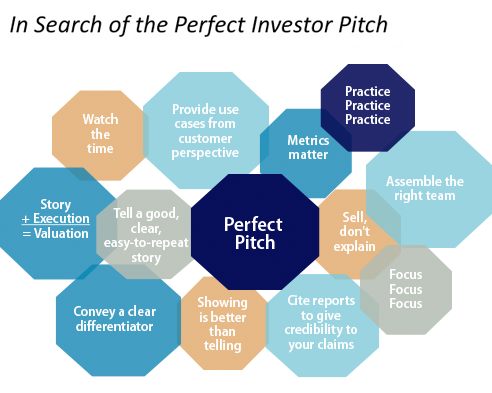 As an example, the graphic below portrays putting together a presentation for investors—seeking to raise capital for a new business.